Boo! The year is almost over! Time for year-end planning. California is "a little short of cashâ€� for refunds. Acceleration is not required for advance payments. Allocation of sale proceeds not respected by IRS. IRS issues guidance on series LLCs. Small Business Jobs Act is enacted. Converting a dentist from an LLC to a corporation. Does my son qualify for an American Opportunity Credit? Subscribe/Unsubscribe from Michael Gray, CPA's Tax & Business Insight! Happy 6th birthday, Panch! 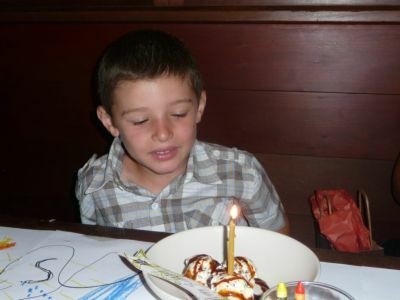 Where did my grandson, the gourmet, want to go for his birthday? Chez Panisse in Berkeley! What is America's second most popular holiday? Halloween! It's time to break out the cauldrons, tombstones and spider webs! Have a fun and SAFE holiday! Hot on the heels of Halloween are Thanksgiving and the holiday season. When we traveled to Ireland and Scotland, Christmas displays were erected right after Halloween, because they don't celebrate Thanksgiving when we do. I hope you're having a good year. We know many are not, so give generously if you are doing well. With the final extended due date for 2009, October 15, behind us, it's time for year-end planning. This is going to be one of the most difficult years for year-end planning in my 36 years in public accounting, because the Bush tax cuts are expiring at the end of 2010 and we don't know what extension legislation, if any, will be enacted. We don't even know the AMT exemption for this year! Congress might not pass extension legislation until next year! We can only guess what the tax laws are going to be after this year. Despite that, we need to estimate the taxes that may be due in April and otherwise work with our broken crystal balls. My wife, Janet, celebrated her 59th birthday on October 4. She is a blessing for my family. I'm so glad to have her in my life. Missed Michael Gray's webinar? Playback is available. Subscribers to this newsletter and Michael Gray, CPA's Option Alert only are invited to "be our guestâ€� for a hosted luncheon seminar at Hobee's Restaurant at the Pruneyard. Registration is required and will be limited to 30 guests. (That's right! No admission charge! Usually we charge $97 to attend!) Michael Gray, CPA will give a presentation about "Year-End Planning For Employee Stock Options.â€� The luncheon presentation will be from noon to 1:30 p.m. on November 12. To register, call Dawn Siemer on a Monday, Wednesday or Friday from 9 a.m. to 5 p.m. Pacific Time. Acceleration is not necessarily required for advance payments. Allocation of sale proceeds not respected by IRS or the Tax Court. An employee benefits consultant sold his business to a bigger company, and continued to work in the business. Based on the advice of his tax advisor, the taxpayer and the acquiring corporation agreed to allocate 75% of the proceeds as payment for the sale of goodwill, qualifying for the 15% long-term capital gains rate. The IRS challenged the allocation of the sale price. The agreement also included a covenant not to compete and a sale of assets for a small amount. The IRS said the sales price didn't reflect economic reality. The Tax Court upheld the IRS in reallocating the sales price to items resulting in ordinary income for the taxpayer. An error in this case was the lack of documentation to establish a value for goodwill. The allocation was arbitrary, based on the recommendation of the tax advisor. If the taxpayer had a study done by a business valuation specialist as part of the process of establishing the allocation and agreement, the allocation to goodwill might have been upheld. The IRS has issued proposed regulations for series LLCs. Under the proposed regulations, each series unit established by the LLC would be treated as a separate entity for federal tax purposes. President Obama signed the Small Business Jobs Act (the Jobs Act) into law on September 27, 2010. Finally we have some tax laws enacted this year, but many of the Bush tax cuts are still scheduled to expire after this year, the federal estate tax is still repealed for 2010 and we still don't know what the alternative minimum tax exemption is for 2010. 50% first-year bonus depreciation has been extended for acquisitions from January 1, 2010 through December 31, 2010. Bonus depreciation has also been extended for personal property with a recovery period of 10 years or longer, and for transportation property. Unlike the expense election, there is no taxable income limit for bonus depreciation and there is no phase out based on the amount of equipment purchased. Under the new law, bonus depreciation is not allocated to cost for long-term contracts when the constructed assets have a depreciable life of seven years or less. In order to allow a bigger depreciation deduction when bonus depreciation is claimed for an automobile, the maximum deduction is increased an additional $8,000 when bonus depreciation is claimed. The 2010 maximum deductions will be $11,060 for passenger automobiles and $11,160 for light trucks. The Internal Revenue Code Section 179 expensing election limit has been increased for tax years beginning in 2010 and 2011 from $250,000 (former limit for 2010) to $500,000. The deduction will be phased out for equipment purchases exceeding $2 million (was $800,000 for 2010). The definition of Section 179 property eligible for expensing has temporarily been expanded to include qualified real property, defined as qualified leasehold improvement property, qualified restaurant property and qualified retail improvement property. The maximum amount of qualified real estate eligible for expensing is $250,000. Taxpayers may also elect to exclude qualified real estate from the expensing, such as if claiming the property would result in having more than $2 million in additions, phasing out the deduction. "Off the shelfâ€� computer software also continues to be eligible for the expense election. S corporations pay a "built-in gainsâ€� tax for appreciated property disposed within 10 years after making the election. Under the American Recovery and Reinvestment Act of 2009, the holding period was reduced to seven years for 2009 and 2010. Under the Jobs Act, the holding period has been reduced to five years for dispositions in a tax year beginning in 2011, provided the fifth year in the recognition period precedes the tax year beginning in 2011. For qualifying stock acquired during the period from September 27, 2010 through December 31, 2010, the exclusion of gain for certain small business stock has been increased from 75% to 100%. Since this period is so short, I'm not going to explain the details. See your tax advisor. The information return reporting requirements for payments of $600 or more have been extended to rental property expenses, effective for payments made after December 31, 2010. For more details about how the new rules affect you, see your tax advisor, or call Michael Gray at 408-918-3161. Financial Insider Weekly is broadcast in San Jose and Campbell on Wednesdays at 7:00 p.m., Pacific Time on Comcast channel 15. The show is broadcast as streaming video at the same time at www.creatvsj.org. I am dealing with converting a Dentistry practice from an LLC to a corporation. The sole proprietor of the LLC also became the president of the corporation and the sole shareholder. As a result, the corporation is a personal holding corporation with a flat income tax rate of 35% instead of graduated tax rates for ordinary corporations. One solution to this problem would be to reduce the sole stockholder's ownership of stock to 95% or less. Is there any other solution to this problem? The corporation is not a personal holding corporation, but a personal service corporation, defined at Internal Revenue Code Section 448(d)(2). The ownership requirement that you mention is defined at Treasury Regulations Section 1.448-1T(e)(5). I am wondering why this decision to convert was made. One alternative is to elect to be an S corporation, which actually has very similar results as being an LLC. An advantage of being an S corporation compared to being an LLC is computing retirement contributions is much simpler, since it's based on W-2 income for an S corporation instead of self-employment income for an LLC. The main way most personal service corporations deal with the problem is by paying out most of the income as wages by the end of the year. Retirement contributions can be made up to the extended due date of the corporate income tax returns. Personal service corporations require careful monitoring and year-end tax planning. My 19 year old son, a full-time college student, claimed a $2,500 American Opportunity Credit on his 2009 federal income tax return. No person claimed him as a dependent. The IRS disallowed the credit. They said if my son did not claim a personal exemption for himself, which is not allowed, then he does not get the credit. Is this correct? The IRS appears to be taking the position that since your son isn't entitled to the personal exemption deduction for himself, it is allowable to someone else, so he can't claim it. If you were entitled to the exemption deduction for your son and elected not to claim it so he would qualify for the credit, you could try fighting this determination. I doubt it's worth the time, expense and hassle to go beyond writing a letter arguing the point.